“CITYNEWS” travelled across to a significant regional public art event last Friday, (February 21) at Tattersalls Hotel in West Wyalong, where NSW Arts Minister George Souris, en route to the Canberra Area Theatre (CAT) Awards in Canberra, unveiled a bronze and stainless steel bas-relief sculpture based on Sir Russell Drysdale’s 1949 painting of the town’s main street. The gala ceremony, which was also attended by the late artist’s daughter, Lynne Clarke, featured a unique viewing of the original sketch on loan from Albury Regional Gallery alongside the $2.5m original painting on loan for the day from its owners, Reg and Joy-Chambers Grundy. 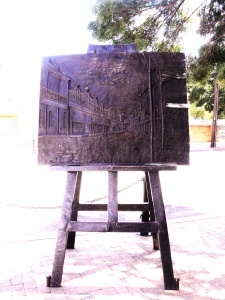 The bas-relief, commissioned by Bland Shire Council from Sydney artists “Gillie and Marc”, was sponsored by the local Barrick Cowal Gold Mine and is in the form of a painting (rendered in bronze) on an easel. It sits on the corner of the hotel from which the artist actually sketched the famous silent street scene. The gala event occasioned a display of civic pride from the town, which has long-regarded the Drysdale painting as having put it “on the map.” Also present were the mayors of West Wyalong and Albury, the NSW Education Minister and Member for Murrumbidgee, Adrian Piccolo, the Federal Member for Riverina, Michael McCormack, Alan Fearon, the general manager of the sponsoring Barrick Cowal Gold Mine and curators from the Albury Regional Gallery. Ray Smith, general manager of the local Bland Shire Council, read a message from former Art Gallery of NSW director, Edmund Capon, describing his first encounter with the late Sir Russell in Sydney, praising him as not only a painter but a draughtsman, whose depictions of stoic characters like stockmen and drovers truly captured the Australian experience. Kevin Mack, the Mayor of Albury, whose regional art gallery had loaned the original sketch for the occasion, said Drysdale’s painting had given West Wyalong “legendary status”. 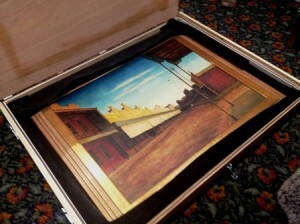 As for the difficulty of getting the real painting to town for a few hours, it meant that in the town at least, the painting was “more treasured than the Mona Lisa”. Husband-and-wife Sydney sculptors Gillie and Marc Schattner spoke of the early influence Drysdale had on each of them. While English-born Gillie said the artist’s paintings had helped her understand the Australian landscape, husband Marc said it was his viewing of Sir Russell’s painting “Moody’s pub” as a child in Melbourne that had made him determined to be an artist rather than an AFL player. Both expressed certainty that their “larger than life-size” sculpture was “vandal proof”. They told “CityNews” of their experiences with public artworks like three bronze rhinos for Dubbo Zoo and a sculpture of Launceston football player Darrel Baldock, which taught them that strength was an important factor in their design. 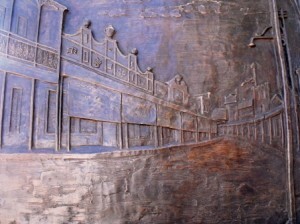 The ‘easel’ was of forged iron but the bronze relief of “West Wyalong” had been cast in bronze wrapped around iron. “It can carry 10 grown men,” Marc said. 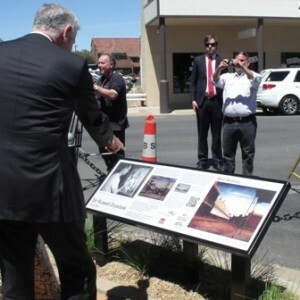 To the Mayor of Bland Shire, Neil Pokoney, the significance of the sculpture as a major destination art work was in the likelihood that it would help characterise the town as a vibrant place that Australians would want to visit. Arts Minister Souris, who joined Ms Clarke in unveiling both the bas-relief and a descriptive panel, said that bringing the original sketch, the painting and the sculpture together was “proof of this city’s appreciation of art”. Mr Souris turned out to be an unabashed Drysdale enthusiast, as he explained that the rarely-viewed “West Wyalong”, which has been judged among the top 10 Australian paintings, showed a deserted street because everyone was at home having tea. 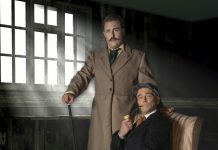 Not so, said some pub patrons, suggesting that Sir Russell had sketched the scene while everybody was inside the pub preparing for the notorious “six o’clock swill” of the era.